For the 10th Holiday season, Montauk’s historic lighthouse will be decked with Christmas lights again. On the Saturday after Thanksgiving you might run into July Fourth-worthy traffic en route to Montauk. That’s because at sunset, a symbolic switch will be flipped. 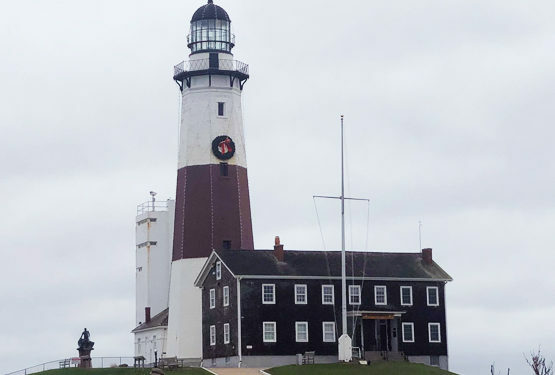 Since 2008, the Montauk Historical Society has bedecked the 1796 Montauk Point Lighthouse with thousands of strands of festive sparklers, thanks to Looks Great Services Inc, a Huntington-based company that specializes in hanging holiday lights. “Hanging all our lights can be a bit precarious!” exclaims 69-year-old Henry Osmers, the national historic landmark’s historian. “But these guys are brave professionals.” After enjoying the lights, drive back by Gurney’s resort for a holiday cocktail by the fire.